captainwalrus wrote: Three drafts and it is already and advanced draft?! Quite frankly, the first three drafts of this map are better than a lot of what's in the drafting room now, which is why it advanced so quickly. Oh, I'm not arguing — great job cairns. But I think that Trafalgar's was better and that didn't get here as quick … just MHO. I don't like that if I take a port, the person who goes after me can take it from me just as easily as any neutral port. The Neon Peon wrote: I don't like that if I take a port, the person who goes after me can take it from me just as easily as any neutral port. Can you offer an alternative? Last edited by cairnswk on Thu Feb 05, 2009 1:38 am, edited 1 time in total. I'm only kiddin' with ya, cairns. Umm, question: is there a space in the mountainst b/w Gordon Town and Port Antonio? And as for gameplay, my worry is that say France could go from France › Pt. Antonio › St. Mary, where they can cut off Bristol at a chokepoint. Well, it would be very hard to do but in a No Cards game one could stack and do that … just trying to find something here . 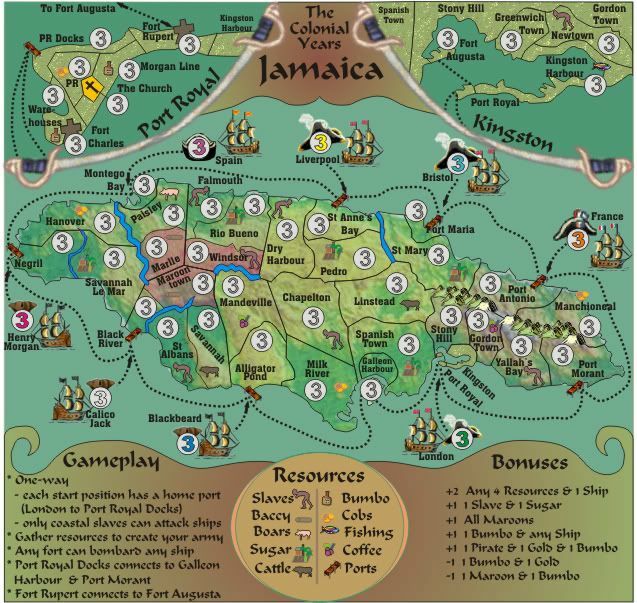 EDIT: and, just for the OCD — having "Kingston" sloped along the swords like "Port Royal" is looks nice. EDIT 2: I assume London assaults the docks, but you should probably put a small arrow in there. the.killing.44 wrote: I'm only kiddin' with ya, cairns. Umm, question: is there a space in the mountainst b/w Gordon Town and Port Antonio? All noted, so how is this? And how are the swords now? Yes, I like the idea of the swords but they are rough and blurry. Are the resources based on Historical sots or are they random? I would add a slave port as a resource. Change the ship London to Britain. Hope none of these have been suggested before, and the graphics look great! Do you have any suggestions Mr Benn? OK this might fix this challenge...there is heaps of graphic issues still here, but i want to get this connectivity right. I've picked up a typo: 'you say all forts can bombard the ships, when I expect that should be all 'ports'. On the legend, you refer to 'maroon'. I'm assuming that this must be the pinkish territories, but that's not clear. The map is coming along nicely; it would be nice to get some feedback from people about the gameplay... it would be good to have a proper reasoned analysis of how balanced (or otherwise?) the resource combinations are. Once that has been done, and I can see a little more support for the map, then I expect that the map will be ready to move ahead into the main foundry. thanks Hotdoggie....i thought it might seem more interesting with the various invaders. Last edited by cairnswk on Sat Feb 14, 2009 1:15 pm, edited 1 time in total.